I am young enough to qualify as a member of the Digital Natives, and although I try to keep up-to-date with all new technologies, I’ve noticed that in some aspects of computer usage I still stick with my old thought patterns that can be dated to as back as the times of Windows 3.1 (when I was learning to use computers). Of course, that’s something we always do to simplify our lives: when you find something that works you keep it, and rarely stop to reconsider its efficiency after some time. And this thought has led me to consider my digital flexibility or in other words try to answer this question: How much do my thought patterns that are related to computer usage change as a consequence of developments in the software I use? This year I was finally introduced to the world of Macs and Mac OS X (Tiger). After a few months of heavy daily usage I can now say that I got used to the UI pretty fast, learned new keyboard shortcuts, but I can still catch myself using certain persistent Windows 3.1 methods that aren’t really adding to my work efficiency. You want a practical example? (If not, move to the last paragraph ;) ) Here it is: I wanted to modify a contact in my address book - and what did I do? 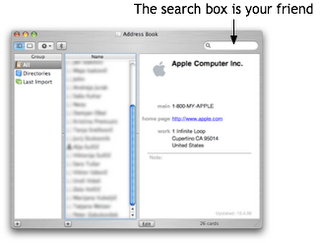 I opened Address Book and started looking for the contact in the list. It was only after a few seconds of intense reading through the list of names that I said to myself: why don’t I use the search box? And so I did - I typed the first few letters of the name I was searching for and ta-da! the contact is ready to edit. Ah, so simple. Another example? One of my favorite Windows applications was the Windows Explorer. Why? Well, because it allows you to organize your hard drives, organize files in folders and sub folders and then have a nice hierarchical view of all folders. Yes, pretty. And I am still very strict about keeping and organizing files in folders - whenever I have more than a few files on a certain subject I make a new folder. Really tidy. So, now I’m on Mac OS X and here I of course use the Finder and guess what’s my favorite view option? Columns of course, so that I can see the structure of folders on my disk. But why is that necessary? What is wrong with the icons view? And an even more important question: Why don’t I use Spotlight to access folders? After all it’s much easier - Command + Space, type in a few letters and you get all related files, folders, calendar events etc. 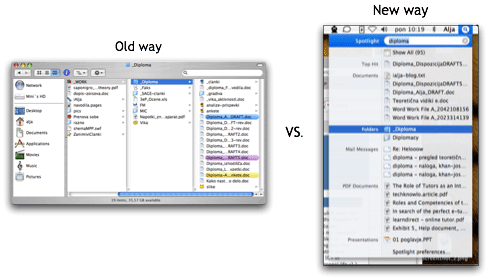 I already use Spotlight to access programs, so why can’t I do the same with files and folders? I don’t know - maybe seeing files so nicely organized in folders gives me a sense of physical presence. But then - why don’t we organize our files like mails in GMail? There you have all messages in one place (the Inbox), and you can use Labels to sort them in categories (each item can have one or more labels) and then it’s so easy to see the elements in a certain category and if you want to search for something specific just use the search box! And the same principle also applies to blogs on Blogger. And it’s a principle I really love to use - but why don’t I use some to manage my files? One thing that drives me crazy is saving and organizing different articles - right now I have an unknown number of folders with the title “Articles” and they are located in different folders for different projects. So, why don’t I put all the interesting articles in one folder and use Spotlight comments to define the topic or/and the project they relate to? Ok, ok, why is all this important for anyone else but me? Because if we want to keep up with new developments we have to try to really understand new ideas and concepts. Of course - I’m not saying we should all start doing things in a new way as soon as the new way is shown - but we could at least try to give the new way a try. And from time to time we can evaluate our digital flexibility. Trying to adapt to new thought patters can after all be a great mental exercise, and for those of us that are trying to bring technology closer to new generations it is almost necessary to understand how new generations are thinking. My younger brother is surely not bothered about folder structures as much as I am, and is certainly more comfortable about dragging and dropping things around the place (that’s something I am still not completely comfortable with ;) ). And with the development of new technologies and ways of interaction these differences will probably increase. Now, there’s no reason to fear the change - instead we should keep an eye on it and from time to time ask ourselves questions like: How digitally flexible am I? Can I do this task in a different way? How are children using computers - can we learn something from them? And at last but not least - we should be prepared to share our experience with others and be prepared to learn from each other.